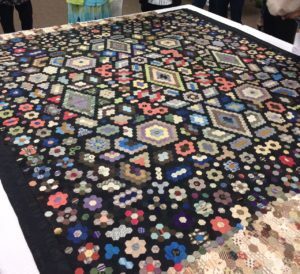 I have just returned from four fabulous days at a Quilt History Retreat in Temecula, CA. 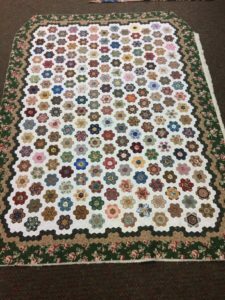 The topic this year was Hexagon and Medallion Quilts. We were privileged to see many from the 1800’s and even a few from the 1700s as well as modern day pieces. The best part was, most of the women at the retreat (36 of us) were hand piecing or hand quilting during the entire time. To say that I was inspired to do more hand work is an understatement! The first quilt I am showing you is a modern Hexagon created by Susie Wright. It is English paper pieced and she is almost done hand quilting it! I am in awe. The next one is also hers, but it has no white “path” between the flowers. Just another way to combine hexagons. This third quilt is my absolute favorite. It is from Janet O’dell’s collection (she is from Australia and was our special speaker for the week). It is a small doll quilt made of hexagons. It has cut outs, so it will fit onto a four-poster bed. 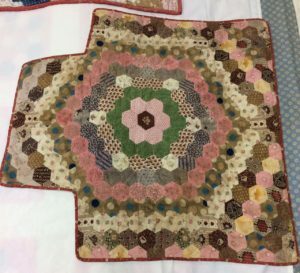 Can’t you just imagine some little girl 175 years ago playing with this quilt and putting her doll to bed under it’s beautiful hexies?! She probably lived in a lovely English house as well. 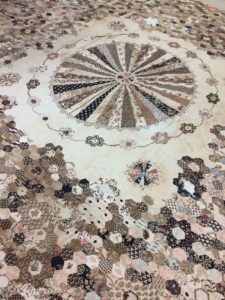 The next quilt is full bed sized and features a beautiful circular medallion in the middle surrounded by floral hexagons. I apologize that the photos are often partial pictures of the entire quilt but when you have 36 women around the tables of quilts it is a little difficult to get a full photo. I love the browns, creams and almost taupe colors that this quilt contains. Although it is over 150 years old I think that most of these colors are close to original and not faded out. One more that I want to share is another Medallion that also has Hexies. It features brighter colors and an unusual medallion center made up of many different blocks. The center square is a single fabric. 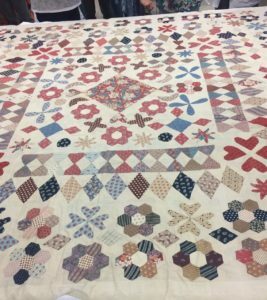 It must have been the quilters favorite and that is why she featured it uncut but in a nice enough size that you could appreciate the red, blue and cream chintz. 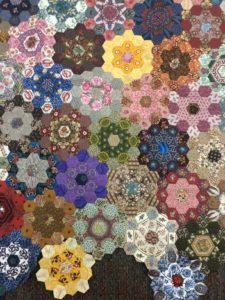 When I stop to think of all the math involved and the lack of patterns available I am amazed at the makers of some of the older quilts and their great skills. This last quilt features Hexagons again but set with a black “path” rather than the usual white. The quilter also combined the Hexies in some unique ways – not always as flowers. Thanks for enjoying a taste of the bed turnings/quilt show with me.